A few weeks ago when I was with Zoe I ended up purchasing a few Barry M glitter polishes from Oxford Circus Topshop. I haven't bought a Barry M polish in years but the prospect of a new a glitter polish or two was too much for me. Lavender Hexograms is a pretty sheer lilac polish with silver, lilac and purple hexagonal glitter going through it. It's similar to the Pop Beauty Confetti nail polish but the glitter is much smaller. I've layered it over another Lilac, Ciate's Sugar Plum. 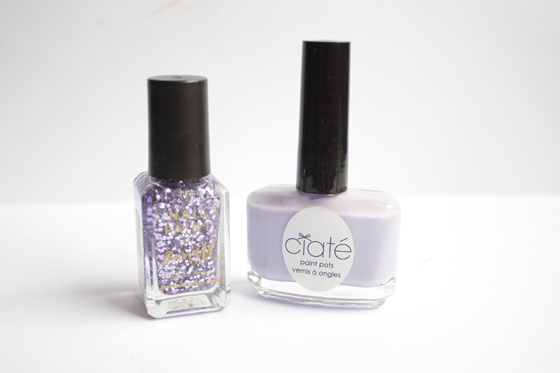 Ciate Sugar Plum is a beautiful pale lilac polish with a touch of grey in it. Not as grey as Models Own Utopia but the same sort of very pale lilac. I really love this combination, not that imaginative but works so well together! I highly recommend checking out the Barry M polish, I've never seen it in any of the Boots/Superdrugs that stock it but it was on sale in the Oxford Circus Topshop and you can also purchase it online!